Do you want to be healthy and stay hydrated every time? Are you tired of getting your bag and the materials inside it wet? Do you wish to have a glass water bottle that is light in weight and have little or no chance of breaking? Are you fed up with drinking from unhygienic or harmful plastic bottles? Do you want a water bottle you can easily carry about no matter the weather condition? 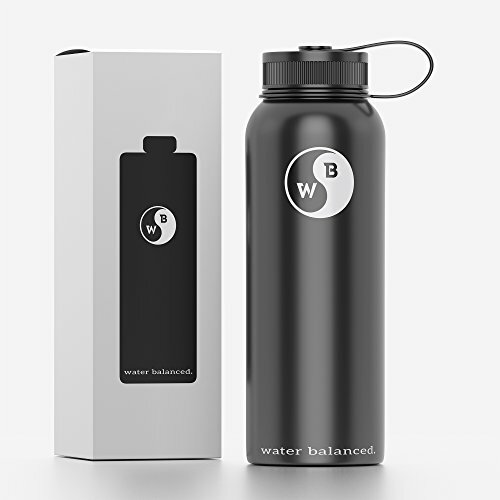 Look no further; the WaterBalanced water bottle offers a reliable solution to your needs. It is durable, safe, keeps temperature longer than ever, leak-proof, offers perfect size. You see the product picture and probably understand that it is made of HIGH-QUALITY MATERIAL - It is forged with 18/8 FOOD-GRADE water bottle stainless steel and 100% NON-TOXIC BPA-FREE PLASTICS making it DURABLE so it can SERVE YOU FOR A LONGER TIME. It also keeps your water free of microbes and bacteria. The Water Bottle is VACUUM INSULATED - The water bottle stainless steel can help keep your beverage cold or hot until the last drop. If you want your beverage cold, it can help keep it COLD FOR 48 HOURS, but if you want it hot, it can help keep your beverage HOT FOR 24 HOURS. DESIGN IS USER-FRIENDLY, VERY RELIABLE CAP - The wide mouth and sweat free powder coat make it easy for you to grip the WaterBalanced water bottle, fill it with Ice and also clean it when necessary. The cap is designed to be very reliable. If you have any questions about this product by Water Balanced., contact us by completing and submitting the form below. If you are looking for a specif part number, please include it with your message.